This kit will add 12.5mm of width at each side of the Ford 4x108 and 5x108 platform cars Focus ST mk2/mk3 and Focus RS mk2/mk3 . A total track width increase of 25mm which is perfect for the new Focus RS mk3. New Spacer range by ST, the idea was to come up with a spacer that was not only more technically focused, but that would cut down on the amount of article numbers a dealer would need to keep in stock. With the new DZX and AZX range we are able to achieve both these goals and more. This allows the customer now to really fine tune their track. 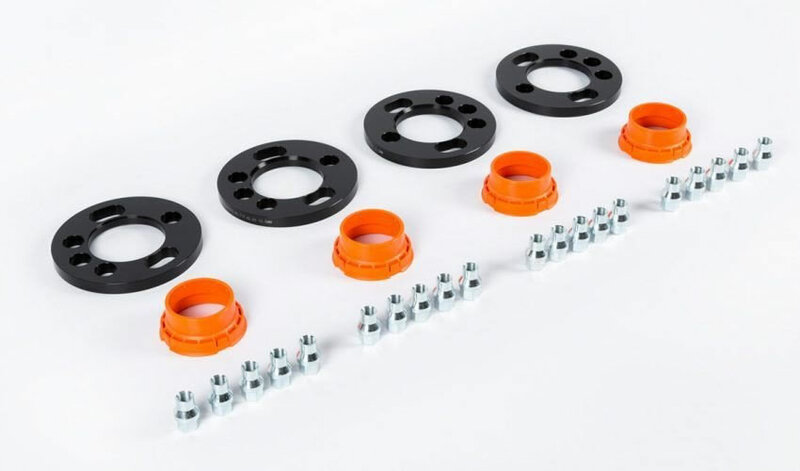 The new spacer package for the Mk3 Focus RS is designed to bring out the OEM wheels to fill the arches, the kit consists of 4×12.5mm spacer discs and 4 of the new revolutionary ST adapters which helps eliminate wheel wobble with its near perfect centering ability. As the RS uses a stud fitment the kit includes our innovative shaft nuts allowing easy fitment. The Pumaspeed Workshop team are ready to fit the DZX Wheel Spacer Kit Universal 4x108 5x108 PCD (Full Car) +25mm in our Head Office located here. Pumaspeed have a specialist distribution team that can dispatch the DZX Wheel Spacer Kit Universal 4x108 5x108 PCD (Full Car) +25mm to any destination worldwide.